Remember when I listened to the audiobook of Cary Elwes reading his memoir of filming The Princess Bride, and it was everything I wanted it to be and one of the best books I read all year? 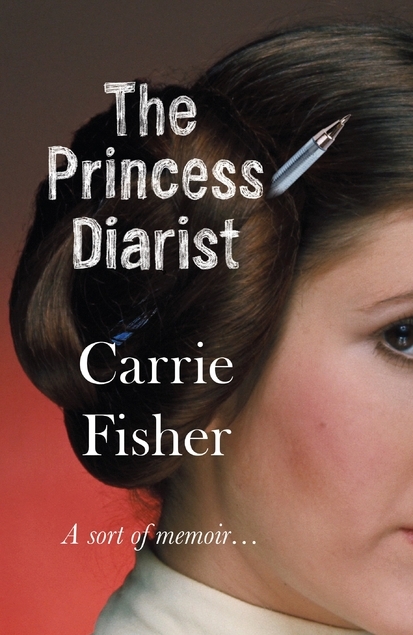 Well–I did not manage to repeat the magic by listening to the audiobook of Carrie Fisher reading The Princess Diarist, her memoir of filming Star Wars. It sounded great–I’d been meaning to explore Carrie Fisher’s writing ever since her death (which still makes me sad), and this promised to be reminiscences of filming the first Star Wars movie, plus excerpts from her journals of the time. Wonderful! And it was, for about the first quarter. She talks a little about her life growing up, her very early film career, and how she first was cast as Princess Leia. I loved the anecdotes of the first time she read the script, and how Leia got her iconic hairstyle. But then, as she says, she met him. I vaguely heard some while ago that Fisher had recently revealed her long ago affair with Harrison Ford–and here I stumbled right into the book that must have done it. A solid half of the book (albeit in the middle) is devoted to “Carrison,” 19 year old Carrie’s affair with the then-married, mid-thirties Harrison Ford during the filming of the first Star Wars. It was a remarkably unsentimental affair, probably some form of friends with benefits except they didn’t even appear especially friendly, and whole passages are devoted to how little he talked. To give Fisher credit, she’s an engaging writer, with a wonderful sense of humor and a very entertaining voice that managed to make this interesting for a lot longer than it otherwise might have been. But it wasn’t enough, because the fact is–I don’t care about her affair with Harrison Ford. The whole thing is kind of squicky (for all she handles it delicately and with class), and I’d really rather draw a big blazing red line between the actors’ love lives and the characters’ love lives (because Han and Leia–love them and their relationship). I guess you know you’re a geek when a celebrity starts in on her scandalous love life and your reaction is–yeah, but tell me about Star Wars!! Tell me more about Leia’s hair, and what was it like acting opposite Darth Vader, and how’d you pull off some of the stunts, and on and on. She gets into that stuff a little–a very little, and mostly talks about Harrison. And those journals? Yeah. Of the excerpts provided, it’s all adolescent relationship angst and poetry. Once she finally gets past Carrison, they’ve already wrapped filming and she’s on to the aftermath. The immediate aftermath was interesting, but I couldn’t muster much sympathy when she got to the convention circuit, especially when she starts describing being a has-been celebrity watching the new blood. I mean–she was Princess Leia, that’s like being the Paul McCartney of the geek world. You’re never not a star. I can’t believe she was ever at a con where she wasn’t a (or the) headliner. I saw her interviewed when the book was first published, when the revelation about the affair first came out. I was deeply touched by her obvious hurt – and she was young then (!). Also, I don’t think some of the women we see on screen as role models were treated well by their productions*. As far as I remember, when Star Wars became really big, Carrie was not feted like the guys were, and it is still the case that the new young thing is right behind the one who’s just made it – and that’s who production is looking for. That is also the case for ingenue men; but there are more realistic, worthwhile parts for older men then there are women (or people of colour) although thank goodness that is finally beginning to change. *After seeing Katharine Ross’s interview on the Butch Cassidy DVD, I can’t even watch what used to be my favourite film any more. I would try Postcards from the Edge, which is probably her most famous book (made into a movie starring Meryl Streep). Can’t say I’ve read it myself, but it probably captures her best as an author since it was very successful.